Test your eyes under normal room lighting used for reading. Wear eyeglasses you normally wear for reading (even if you wear only store-bought reading glasses. 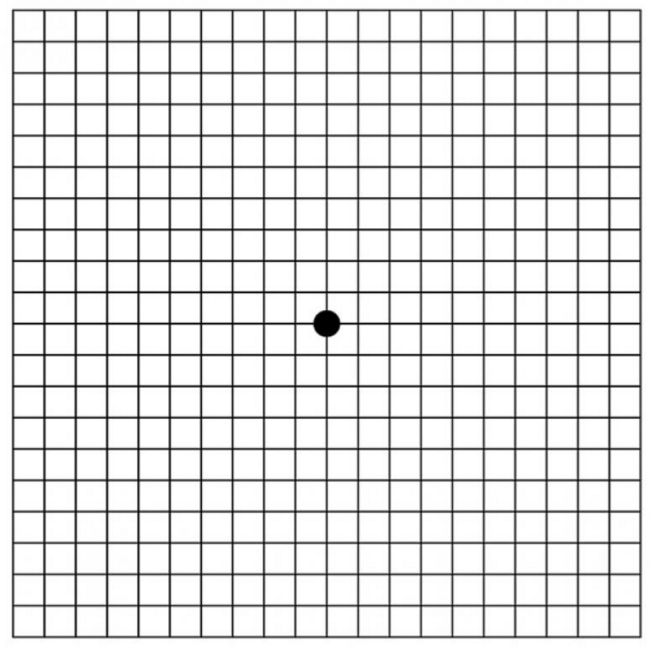 Hold the Amsler grid approximately 14 to 16 inches from your eyes. Test each eye separately: Cup your hand over one eye while testing the other eye. • Do any of the lines in the grid appear wavy, blurred or distorted? • Do all the boxes in the grid look square and the same size? • Are there any “holes” (missing areas) or dark areas in the grid? • Can you see all corners and sides of the grid (while keeping your eye on the central dot)? Switch to the other eye and repeat.